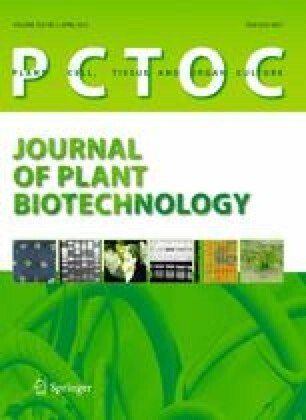 This study aimed to induce in vitro polyploidization in diploid ulluco (2n = 24) using oryzalin, an antimicrotubule agent. Nodal segments were treated with 0, 20, 25 or 30 μM oryzalin for 24 or 48 h. Ploidy determination of regenerants was based on flow cytometry and chromosome countings in metaphasic cells from root tips. After polyploidization, microtuber formation was induced in plantlets. Determination of starch content using spectrophotometric analysis, and vitamin C content by titration with 2,6-dichlorphenolindophenol were carried out to assess diploid and octoploid microtubers. Colour of in vitro plantlets was evaluated using the RHS colour chart. Out of 120 nodal segments exposed to oryzalin, 2.5% were octoploids (2n = 96). The most efficient conditions for inducing polyploidy were treatment with 20 μM oryzalin for 24 h, followed by 25 μM oryzalin for 48 h. No tetraploids were obtained. Moreover, flow cytometric analyses of the nuclear DNA contents revealed extensive endopolyploidy in both diploids and octoploids. Morphological differences of the octoploids compared to diploids included lower plantlet height, significantly thicker stems and shorter and darker leaves. Although the average weight of octoploid microtubers was lower compared to diploid ones, they were rich in vitamin C and they had lower starch content. These preliminary results indicate that octoploids may be used in further breeding efforts to obtain low-starch ulluco varieties with improved antioxidant properties. The authors are grateful for assistance with chromosome counting provided by Vlasta Jarolimova (Institute of Botany ASCR). This research was financially supported by Internal Grant Agency of Institute of Tropics and Subtropics, Czech University of Life Sciences Prague (Project No. 51110/1312/3108), Academy of Sciences of the Czech Republic (Project No. AV0Z60050516, Institute of Botany ASCR) and Ministry of Education, Youth and Sports of the Czech Republic (Project No. MSM0021620828, Faculty of Science, Charles University in Prague).